As the name implies, a temperature controller - often called a PID controller is an instrument used to control temperature. The temperature controller takes an input from a temperature sensor and has an output that is connected to a control element such as a heater or fan. To accurately control process temperature without extensive operator involvement, a temperature control system relies upon a controller, which accepts a temperature sensor such as a thermocouple or RTD as input. It compares the actual temperature to the desired control temperature, or setpoint, and provides an output to a control element. 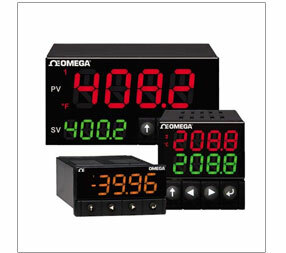 OMEGA Engineering offers a wide range of PID & Process Temperature Controllers in Australia. How do Temperature Controllers work? How to Choose a PID Controller? Since temperature controllers are generally mounted inside an instrument panel, the panel must be cut to accommodate the temperature controller. In order to provide interchangeability between temperature controllers, most temperature controllers are designed to standard DIN sizes. The most common DIN sizes are shown below.